Georgetown University students have approved a nonbinding referendum that calls for each undergraduate student to pay a fee that would benefit the descendants of 272 slaves whom the university sold in 1838. About 66% of voting students were in favor of creating a "Reconciliation Contribution" that would begin in the fall 2020 semester, according to the Georgetown University Student Association Election Commission. The fee would only be enacted if the university's Board of Directors approves it. A statement from the university said the vote would guide the school's dialogue with the descendants of enslaved people, but made no indication that the fee would be implemented. "There are many approaches that enable our community to respond to the legacies of slavery," Todd Olson, Vice President for Student Affairs, said in a statement. "This student referendum provides valuable insight into student perspectives and will help guide our continued engagement with students, faculty and staff, members of the Descendant community, and the Society of Jesus." The resolution calls for undergraduate students to pay a $27.20 fee each semester, similar to a student activities fee, meant to fund projects that directly benefit the descendants of enslaved people that the Society of Jesus sold in 1838 to stop the school from going into bankruptcy. The amount of the fee is symbolic, representing the people 272 enslaved people sold. Nearly 58% of eligible students turned out to vote in the election, with 1,304 voting against the referendum and 2,541 voting in favor, the GUSA Election Commission said. Many associated with the university celebrate the approval of the referendum, even as a symbolic measure. "I'm estatic," said Melisande Short-Colomb, a Georgetown student and descendant of slaves. "I hope that this will spread through the edifice of Jesuit education and colleges and schools and institutions accross America." The GUSA president and vice president also praised the result, calling it a "meaningful step forward in atoning for Georgetown University's legacy of slavery." "The students of Georgetown have indicated their clear support for the University to take reparative action in order to address the outstanding moral debt incurred by the University's decision to engage in and profit off of slavery," Norman Francis, the student body president, and Aleida Olvera, the student body vice president, said in a statement. But the university president, John J. DeGioia, issued a vaguer and measured response, saying in an email to the school community that "there is more work we can do," and that he "will engage key leaders in our Georgetown, Descendant, and Jesuit communities and our faculty, board, and student leadership to chart a path forward." "Our commitment as a community to this work, and to working with Descendants and the Society of Jesus, must be a long-term commitment that challenges all of us and contributes to a more equitable and just society," DeGioia said. Recently, universities across the U.S. have been acknowledging their ties to slavery, including American University. 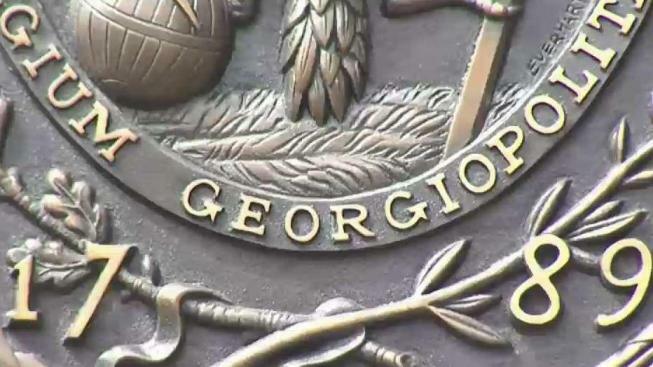 After the news surfaced about the 1838 sale of slaves, Georgetown University announced initiatives including preference in admission to descendants and renaming two buildings and a memorial, but some say that's not enough. CORRECTION (April 12, 2019, 2:29 p.m.): An earlier version of this story said the enslaved people were sold in 1834, not 1838.